I made this hour-long guide to murder ballads for London’s Resonance FM, which gave it its first airing on January 28, 2016. It uses audio clips from Unprepared To Die’s interviews with all the people pictured above, and you can hear it archived on the Mixcloud page here. 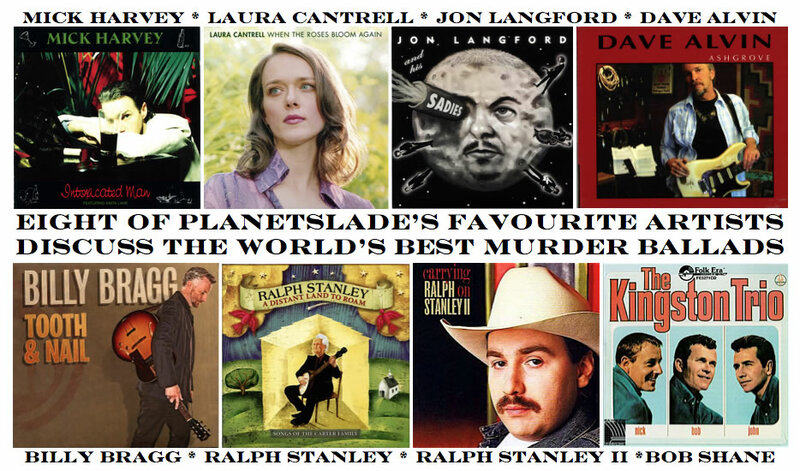 We’ve called the programme Killer Songs, and I use it to briefly tell the story of five classic murder ballads from my book, playing some of these songs’ best recordings as we go along. All this is interspersed with my interviewees’ insights and comments on the same five ballads. They bring a songwriter’s eye to discussing these tales’ endless fascination and reveal what it’s like to inhabit a classic murder ballad as you record it yourself. You’ll find a full playlist for the programme’s music below, together with some thumbnail biographies of my interviewees. Many thanks to Resonance FM producer Michael Umney for making the whole project possible. 1)	Stagger Lee – Nick Cave & The Bad Seeds (1996). 2)	Stagger Lee – Lloyd Price (1958). 3)	Stagger Lee – Billy’s Band (2007). 4)	The Lonesome Death of Hattie Carroll – Bob Dylan (1963). 5)	The Lonesome Death of Hattie Carroll (Live) – Bob Dylan (1975). 6)	Knoxvile Girl – The Louvin Brothers (1956). 7)	Knoxville Girl – The Handsome Family (2002). 8)	Tom Dooley – The Kingston Trio (1958). 9)	Tom Dooley – Steve Earle (2002). 10)	The Murder of the Lawson Family – The Carolina Buddies (1930). 11)	Murder of the Lawson Family – Dave Alvin (2000). 12)	Tom Dooley – Snakefarm (1999). 1)	Mick Harvey: Guitarist with Nick Cave & the Bad Seeds from 1983-2009. Played on the band’s classic 1996 recording of Stagger Lee. 2)	Laura Cantrell: Country music artist and former WFMU radio DJ. Recorded Poor Ellen Smith for her 2005 album Humming By The Flowered Vine. 3)	Jon Langford: Founder member of UK cowpunk legends The Mekons. Helmed Bloodshot Records’ 2002 compilation The Executioner’s Last Songs. 4)	Dave Alvin: Founded The Blasters with his brother Phil in 1979. Recorded Murder of the Lawson Family for his 2000 solo album Public Domain. 5)	Billy Bragg: Mixes protest with a fine line in love songs. Borrowed Dylan’s Hattie Carroll structure for his own The Lonesome Death of Rachel Corrie. 6)	Ralph Stanley. Half of the great bluegrass duo The Stanley Brothers. Cut Knoxville Girl with brother Carter on 1969’s The Stanley Brothers Live. 7)	Ralph Stanley II: Son of the above. Sang and played with Ralph senior’s band The Clinch Mountain Boys in the 1990s. 8)	Bob Shane: Last surviving member of The Kingston Trio’s original line-up. Their 1958 recording of Tom Dooley was a global chart smash. I’m keen for this programme to be as widely-heard as possible, so if you’d like to give it an airing on your own internet radio station, community station or podcast, please get in touch via the “Contact Me” button at the top of this page. Anyone taking up this offer must agree to broadcast the programme in full, including the Resonance FM credit at the end. Issues such as PRS payments and podcast licensing remain your own responsibility. Killer Songs is © PlanetSlade.